Some of Belmont’s most talented musicians and producers came together Saturday night to create a performance almost a year in the making. The result? Best of the Best Showcase 2019. The evening featured performances from the winners of the four 2018 to 2019 showcases, along with the ASCAP Writers Night winners and a special guest performance from Best of the Best alumnus Jake Wesley Rogers. Not only was the music top notch, but it was also supported by fantastic lighting, audio and introductory videos, all of which converged into a high-quality concert experience the audience won’t soon forget. Christian Showcase winner David Andrew kicked off the night with an uplifting set, packed with vocal runs, joyful dance moves and heartfelt interludes in which the artist offered encouraging words to the audience. Andrew’s set included a cover of “Haven’t Seen it Yet,” by Christian artist Danny Gokey and two originals. His passionate inflections and expansive vocal range resembled an early Stevie Wonder, a similarity which was solidified when he covered Wonder’s “Love’s In Need of Love Today,” complete with a dance break with his three background vocalists. As the production staff transitioned between mainstage acts, the four ASCAP writers each performed an original song on one of two side stages. After Grace Blosser’s moving tribute to her father, “Daddy’s Shotgun,” the Rock Showcase winning Lemondrop delivered a solid, high energy performance. The set kicked off with lead singer Joni Lemons perched on the edge of the stage, singing an acapella chorus of the Jonas Brothers’ “Sucker,” soon to be joined by her full band and two backup singers. 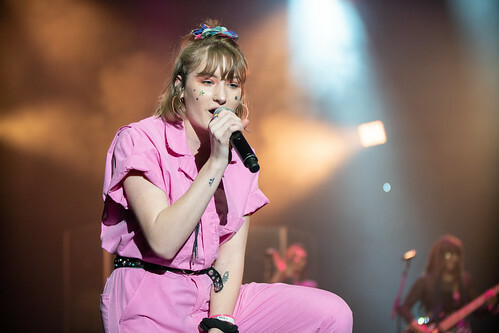 Decked in a bubblegum pink jumpsuit with a flower-adorned bass guitar, Lemons blended her upbeat rock sound with emotional lyricism and storytelling. The band performed two original songs, “Seven” and “That’s All She Wrote,” which showcased the talents of Lemons and her background vocalists. Ashley Cooke drew the largest crowd to the front of the Curb Event Center so far with a fun set that reminded the audience why she had won Country Showcase only a few weeks before. A perfect representation of modern country, Cooke’s performance featured shredding guitars, driving drumbeats and an energetic sound. Her recent single, “Through This,” was the highlight of Cooke’s set, a ballad-turned anthem that showcased Cooke’s fluid lyricism and plaintive storytelling. Before leaving the stage, Cooke delivered a high energy rendition of “Life is a Highway” that had many audience members smiling and singing along. After Cooke, Delany Ramsdell sang “Kitchen Window,” a sweet song she wrote while home on a break from school. As Ramsdell performed and Urban Pop Showcase winner Bren Joy prepared to take the stage, eager fans started lining up at the front of the Curb Event Center for the strongest performance in an already spectacular lineup. Joy opened with a cover of Ariana Grande’s “Needy,” setting the stage for a genre-blending set overflowing with talent. Joy showed off the talent of his background singers by allowing them each to solo as an introduction to his song “Henny in the Hamptons,” but then stole the show with his own theatrical but authentic vocal performance. His cover of Bruno Mars’ “Chunky” got most of the audience on their feet and showcased the talent of his two keyboardists. With the end of Joy’s set, the showcase winners’ performances came to a close, but the showcase team still had more in store for its captive audience. 2017 Urban Pop Showcase winner Jake Wesley Rogers returned to the Curb Event Center stage only a year after his unforgettable performance at Best of the Best 2018. The alumnus spun on stage in a red jumpsuit and veil to “Jacob from the Bible,” the lead single off of the EP he released on Friday. A seasoned performer, Rogers kept his audience enthralled with music from the EP, along with “Evergreen,” a song he released during his time at Belmont. He wrapped up the night with the soulful, piano-driven “Holy Man,” the cherry on top of an already incredible night of music. With powerful songwriting, impressive musicianship and genuine enjoyment from so many of the performers, Best of the Best 2019 truly demonstrated the talent and passion that makes Belmont’s Showcase Series so special. Photos by Colby Crosby and Tina James. Contributing reporting from Henry Gregson.